This is a simple agreement that gives someone formal permission to park his or her car on it. 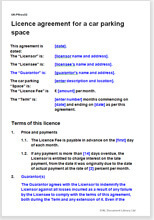 This agreement creates a licence to park a car, motorbike or other vehicle on your property. It includes a set of conditions of use for your licensee. The person who rents your space must do so for personal use, not business use. If he or she uses it for business, he or she becomes protected by the Landlord and Tenant Act 1954. That gives you fewer rights to end the arrangement when you want. For a business arrangement, use this lease. If you are licensing a space you yourself occupy as a licensee (such as for a flat you rent), use this agreement in place. "Great to be able to download and use a variety of legal documents for all types of lettings."